Despite Chipotle's famously limited menu, the fast-casual burrito chain's most creative customers have come up with a handful of menu hacks/secret menu items over the years like the Quesarito and Nacho Bowls. But now, some customers are starting to notice a somewhat-secret Chipotle menu that's apparently been hidden in plain site this whole time: the kids menu. As explained in a report by Business Insider, Chipotle has long offered kids meals, but because the company doesn't appear to list them on all of its restaurants' menu boards, you've probably never heard of them. 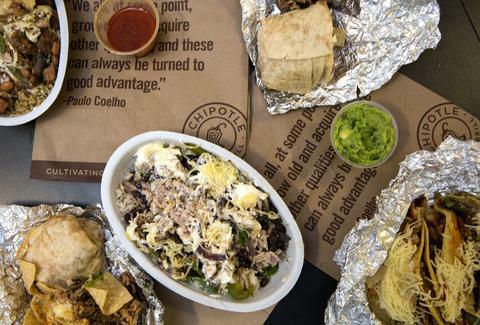 Basically, the meals are smaller, kid-sized versions of what you might typically order at Chipotle, and best of all, they're significantly cheaper. The menu includes a "kid's build your own" taco meal and a "kid's cheese quesadilla" meal, both priced at around $5, although the prices will vary based on your area. For example, the taco meal is $4.75 in the suburbs of Chicago, but in New York City, it's $5.75, according to Chipotle's online order form. Either way, that's way less than the cost of a regular order or tacos (three for about $9-$10 in NYC) or your favorite burrito bowl (at least $8-$9 in NYC). It's worth noting, however, that you're getting less food and fewer customization options (no unlimited fillings like cheese, salsa, etc. ), but it could be the way to go if you're looking for a cheap snack or something with fewer calories, according to the report. Oh, and it could be worth considering if you repeatedly fail to eat your entire Chipotle burrito despite your best efforts. OR, if you live in one of the regions where Chipotle offers free and discounted booze for happy hour, a kids meal sounds like the perfect snack to have with your margarita. Tony Merevick is Cities News Editor at Thrillist and will probably just continue to pay up for more food to be honest. Send news tips to news@thrillist.com and follow him on Twitter @tonymerevick.